I’ve done some crazy things. Like running 150 miles in the middle of Illinois with no sleep in over 47 hours. Or doing over 51 marathons/ultras per year for three years straight. But my latest quest had me seeing double. I wanted to finish Cascade Crest Classic 100 and Plain 100 in the same year. Only thing was, they were only two weeks apart. There have been 8 runners who have done the double, 6 guys and now two women, including myself. The year Liz McGoff did it was three weeks apart. The closest that I have done back to back 100s were 3 weeks apart. I knew I could finish CCC, as long as no major problems arose. I was going for my 5th finish, so I knew how to pace myself. But Plain scared me. I had trained on about 80 miles of it, and it was hard. What’s more, it was more like 107 unmarked miles with no aid stations and one drop location past halfway. My year of running up until these was limited to only races and training miles on the weekends when I was not on call. I had little or no exercise during the week due my long work days and nights. I knew my times were getting slower, but I felt my endurance was still solid. I had two good 100 milers earlier in the year with Badger Mountain and Lumberjack. I suffered through a warm San Diego 100, just making the cut offs. It had been a long time since my asthma affected my running so much. After recovering from San Diego, I needed to get back into training for Cascade and joined fellow Trail Nuts Pat Ackley and Tracey Nguyen on a Plain training run. I had no intention whatsoever to run Plain, but by the end of the run, Pat and Tracey had me nearly signed up. The trail was spectacular. I just fell in love with it. Thus started my CCC/Plain quest. Plain consists of two large loops with Deep Creek campground in between. Our first training run did not go smoothly. After running the first 2-3 miles of the second loop, we took a wrong turn. We ended up on a 2 mile loop but did not realize that we were running in circles until ¾ through the 2nd time where I had déjà vu. I said to Pat, “We’ve been here before.” We placed some sticks down that spelled Van and found it on our 3rd time, confirming our mistake. After wasting additional time down more wrong trails, we finally found where we made the incorrect turn and got on the appropriate trail. If we had listened to Tracey, we wouldn’t have wasted all that time. We didn’t cover as many miles of the course as we would have liked but still had a nice day on the trails, except for being eaten alive by mosquitoes. There must have been a recent hatching. The second Plain run came after I returned from crewing and pacing friend Jess Mullen at Badwater 135. She did great! But I was eager to get back on the trails. We tried again to cover more of the second loop of the Plain course (with Eric Barnes) but got turned around by snow. A week after that, I ran the Trail from Hell section up to No Name Ridge on the Cascade course. This was a mistake. After the two hard Plain training runs, I suffered through this and had a dismal personal worse at White River the following weekend. No matter, it was my seventh WR and I was okay with a long day. It was just so beautiful that day! After a very busy call weekend on the first weekend of August, I joined Pat and Tracey two days later on Tuesday for our last Plain training run. We woke at 2am to drive to the trailhead and started running at 6am. We wanted to cover the first loop that started and ended at Maverick Saddle. This was to be 43 miles. It started out well. We were moving well and made all the correct turns. We practiced eating, drinking, carrying all our food, and getting water from the streams. The second half of the loop killed us. The climb up Tyee Ridge was long and hot. The run down to Mad River was overgrown and technical. It took us 16 hours exactly to finish the loop and I was back in my own bed 24hrs later at 2am. I had to be back to work at 6am. I rested the next 2 weekends before Cascade. I was pumped for my 5th! But it was going to be a hot one. I started out slow and took it nice and easy up Goat Peak after the initial 3.8 miles. I have heard of other runners ruining their race on this climb. I think there were only a few runners behind me. My slower pace for the heat felt comfortable, but by Tacoma Pass at mile 23, I was already 24 minutes behind last year’s schedule. Still, I didn’t want to push it. I maintained the same effort. I saw Ken at Stampede at mile 34. It was nice to see him. I was now almost an hour behind schedule. In addition to the heat, there were a lot of blow downs that slowed everyone. It was like an obstacle course. We expect that with the Trail from Hell but not in the first half of the race. Darkness came sooner this year in the race for me. I reached Ollalie at 12hr22min. I was not worried. I was having a nice run. I picked up my garden gloves from Ken and headed for the rope section. I learned this from Scott McCoubrey. He said to grab the rope and run down facing forward, not backwards. Just grab and go. So I did. What a trip! Yippee! I hit the John Wayne tunnel feeling good and passed several runners before Hyak. There, Ken helped me switch to my hydration pack. I was using a waist pack with a bottle and one hand held up until that point. Next year, I will keep the waist pack. Here, Dean Kayler, my pacer, joined me. He was great. Just the right amount of talking and encouraging. He filled me in on the latest news. Like Eric and Iliana Sach expecting their first baby soon. It took me over 1 ½ hours longer to finish the second half compared to last year. There was no moon, so the stars really came out. The Trail from Hell took the usual amount of time but this year for me, it seemed like it passed by without feeling endless. Ken had some pizza and butternut squash soup waiting for us on the road to No Name Ridge aid station. I got into the car so that I wouldn’t get cold while exchanging my food. My asthma hit after mile 70 on the climbs, especially on the Cardiac Needles. For the first time in any race, I could actually hear myself wheezing, when before, it was just labored breathing. 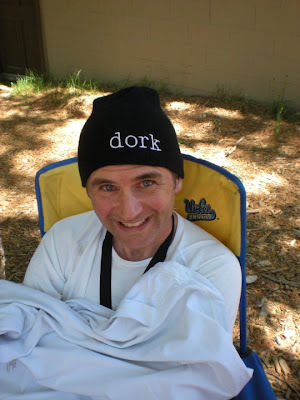 Still, I was able to pass more runners than passed me (at Hyak, I was in 76th place and I finished 62nd). That’s always a plus! 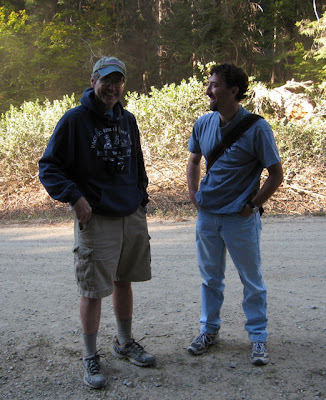 Seeing Glenn Tachiyama on Thorpe Mountain signified we were getting closer to the finish line. The view was breathtaking with Mount Rainer in the distance. Sunday was a scorcher. But I had to get going. Ken was waiting for me, and I had to work the next day. Dean had mentioned to me that when we got to mile 95 at Silver Creek, he might want to nap in Ken’s car while I finished. I didn’t blame him. At times I was moving so slow on those Needles that it was hard for him to stay awake I’m sure. As soon as we arrived, I dropped my pack (finally! ), grabbed my hand held and a few GUs, and took off. I didn’t even give Dean any time to change his mind. I tripped pouring water on my head and nearly ruptured my Achilles! I ran for a while but looked back constantly, not wanting another girl to pass me on that last stretch. I passed a guy and his pacer. When I didn’t see any girl behind me, I let myself relax and walked on and off. I figured I needed to save as much energy as I could for Plain. With about half a mile to go, I looked back one last time and saw a girl barreling down the road. I had just taken a GU and turned on the afterburners! I really didn’t want to sprint this last section but was glad I had enough in me to get going. At least I looked strong finishing. Charlie was manning the microphone at the finish like he does every year and announced that I was arriving at the finish, “A Northwest institution,” as he put it. Thrilled, I crossed in 28:28:41, 11th woman and 62nd overall of 140 starters. Charlie handed me my 5-yr silver buckle. Yes! Five down, 5 to go. I am aiming to be the first woman to finish 10 Cascades. Each year seems harder and harder. But with Ken as my crew and pacers like Dean, I know I have a few more in me. Five down, 5 to go! After finishing, I was given a bucket to soak my feet. For some reason, this year, my feet ached terribly after soaking them in the cold water. I had noticed that at the first creek crossing after French Cabin. I avoided getting my feet wet after that if at all possible. Ken drove Dean to his car at Hyak and picked me up a burger at Mountain High Burgers. I freshened up as well as I could and watched other runners come in. I couldn’t stay until the end since I had to be at work by 6am the next day. I had blisters on the top of my foot where the tongue dug in on both sides. Other than that, my feet were great. The next day, I felt okay at work other than being tired. Of course my legs swelled terribly by the end of the day, standing while assisting in surgery. I knew I just had to get through it and looked forward to my Tuesday off. My blisters were pretty sensitive and caused me to walk funny. People thought I was trashed from my 100, but I didn’t feel that bad. I had to do some housecleaning on Tuesday and this actually kept me loose. By Wednesday, I felt pretty normal. Unfortunately, I was on call the following weekend (Labor Day). Normally, we are on call Friday, Saturday, and Sunday. But since this was a holiday weekend, I was also on call Monday. Friday, I was at work until 12:30am, 18 ½ hrs from when I started. Then rounds Saturday morning, a surgical case Saturday afternoon, and then I was called in at 11:30pm for an open tibia/fibula fracture surgery until 3:30am. Back to the hospital to do rounds Sunday and Monday morning but thankfully no more cases. My pager was going off constantly with calls from the floors. Needless to say, I did not get to rest from Cascade. I managed to pack my supplies for Plain and did have Tuesday off to make up for the long weekend. I worked Wednesday and Thursday and had Friday off to attend the mandatory meeting for Plain. By now, my blisters had healed. I had not run since Cascade, so I was not sure how my legs were feeling. I just trusted my body would do what I asked it to. I spent Thursday night frantically getting last minute things ready. Sleep was okay but not as good as it should be two nights before race day. More frantic last minute packing Friday morning. Pat was nice enough to pick me up at my place and we drove to Tracey’s house. We took her big Toyota Sequoia. I had packed a bunch of food, most of which I didn’t eat of course. On our ride over, we again debated whose idea was this anyway. Pat said it was all Tracey’s idea, but we all knew the truth. It was their fault I got sucked in. Tracey had a dedicated song for Pat, something she was planning on singing as the miles accumulated, titled, “She F’ing Hates Me!” You know the song. Our first order of business was to drive to the dirt road section after Alder Ridge. We got a good idea of how long that road section was and also where to re-enter the trail. We had enough time to go to the Plain Hardware store to pick up our finisher’s hooded sweatshirt. Actually, it says “PLAIN Hardware, Est. 1997.” Plain is in big letters and the hardware is smaller. The race does not have a shirt. Interestingly, Plain 100 started in 1997. Pat and I got one, but Tracey could not find a size or color she liked. I got the idea from Scott Tomchick when I saw him wearing it handing over one of the ropes used for the rope section on Cascade. I knew I had to get one. We arrived at the Lake Wenatchee Recreation Center (LWRC) 10 minutes before the mandatory briefing began. Chris Ralph greeted me warmly and handed me my Plain coffee cup and handkerchief. I donated $10 for a Plain 100 patch. I chatted with a few other runners before settling down. First, Search and Rescue spoke. The magic word for the weekend was “happy”. At each checkpoint (6 total), we were instructed to give them our number and the word happy. I suppose it’s a way to get you turned around if you are having a rough stretch. I know several times I had to force myself to say it. There were 25 starters and 19 volunteers/Search and Rescue. It felt good to know that they were out there. They also let us know that we could drop trash with them, which was a nice thing, in their efforts to keep trash off the trails. Then Tom Ripley spoke. This guy has lungs! He went over the course directions with a large map and had to correct himself a couple times! It was nice to know that I could visualize all the turns we had practiced on our training runs. There was just that one section that we had never run. He talked about locations to get water. No snow left on the course. Water crossings were a non-issue. Cut-offs. Course rules. We had to carry all our supplies at all times. No dropping our packs at out and back sections. Then Chris Ralph spoke briefly. She asked me to raise my hand. She said that I did not want to finish Plain without a Buckle. Not true! I would have run Plain even without a buckle but thought it would be a nice reward and something to work towards. So I spoke to Eric Barnes, who had access to materials. He created a very nice granite buckle with laser etching in big letters, PLAIN 100+ and an elevation profile of the course. I had to remind Chris that runners had to purchase it. Eric was able to make them for $40. It was also available to past finishers. The meeting was followed by a great spaghetti feed served by the “Hotties.” There was soup, salad, bread, meatballs, and dessert. Something for everyone. 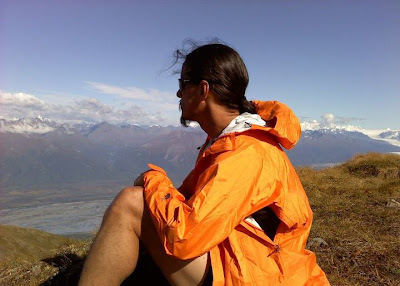 I spoke with Tim Stroh, who has started 11 Plains and has finished 5, the most of any runner. He said that this was going to be the hottest Plain ever with temps predicted to be mid to high 90s. I met Bogie Dumitrescu from Colorado, who said we had an advantage being able to train on the course. True. Adam Lint talked about his Wonderland trail adventure a couple weeks ago. Michelle Maislen was running with her adventure running partner Deb McInally, who was taking on Plain as her first 100. Michelle, however, was still running a bit of a fever that she had been dealing with the week leading up to Plain. Alex Swenson and I chatted a bit. I spent the most time talking to Betsy Kalmeyer from Leadville, CO. I looked her up on Ultra Signup and it showed she has finished Leadville several times but more impressive-Hardrock something like 12 times. I remember reading about her in TrailRunner Magazine and she mentioned she was a Physician Assistant, just like me. I wanted to meet her and we chatted about our jobs. We finally decided to head to our hotel. Most runners were camping at the LWRC (they had the choice of camping in their tent or trailer outside or could sleep in the meeting lodge). Sounds like sleeping outside was better since people were up late talking and the breakfast crew was going to start getting things ready at 2am. I had told Pat and Tracey that I wanted a hotel room. I’ve camped plenty of times before a 100 miler (been there, done that). It also got us away from other runners and allowed us to relax some. We stayed at the Leavenworth HoJo. Trace and I shared a bed and Pat had one for himself. We spent about an hour getting our gear laid out and food made. I took a quick shower. I called Ken and said I would see him Sunday. We were in bed by 9:30. Sleep was a little restless for me. Trace and Pat said they slept well. The darn fridge kept making noises. It didn’t seem to bother them. We were up at 2:30am and got to the lodge for the breakfast at 3:45. I sat in the car eating my sushi for breakfast. Didn’t want to gross anyone out but it has worked well for me. Don’t worry, it was all cooked meat and I had kept it refrigerated. After going through Deep Creek, we headed up the road, initially nice packed gravel/dirt road for 3 miles to Deer Camp Campground (6.4mi). I had my tunes on and was singing to Pat. I’m sure he really appreciated that and wondered if I was going to keep that up for another 100 miles. The temp was really quite comfortable. I had a plan of eating real food alternating with a GU every half hour. It worked pretty well for about 70 miles, then I was mostly taking in GU. I took a Protein Power Bite (chocolate or peanut butter) when I didn’t want a GU. My solid food included Trader Joe’s chocolate croissant and homemade pumpkin or banana bread. I made turkey sandwiches, but they got so squished, they looked too unappetizing to eat. I brushed my teeth every 6-8 hours and used my inhaler about the same interval. When we got to Deer Camp, we took a hard left and headed up a primitive dirt road for another three miles. We arrived at Maverick Saddle (9.4mi) in 2:16 after starting. Winner Adam Lint got there in 1:32. There were only 3 runners behind us. Pat or Trace had a shoe malfunction and all but one runner (Scott Tomchick) passed us before the first water stop. About a mile in, we dipped our water bottles into the Mad River and treated it with our SteriPens (Pat and I both had one). We did just a little bit of bushwhacking to get to the river and as we were climbing out, Scott strolled by and said there was a better spot up ahead. He was already very sickingly chipper. What a great guy! In another half mile, we turned left uphill onto the Hi Yu trail (11.0mi). Please keep in mind that these mileages I post are off the Green Trails Map. I feel they are pretty accurate. Hi Yu went up for a bit. Scott passed us here. The views were already in site and spectacular. There was some down, flat, up again, and down to Lost Lake trail (14.5mi). There were some good runnable sections here. Of course, we walked any hill that in a shorter race could have been run, but we knew better. Not far from the next trail intersection at Billy Creek (17mi), we filled up one water bottle. It was starting to get warm. There is a ranger station there, and someday on one of our training runs there, I would like to take the very short detour there and take a peek. We loaded up at another water stop about a mile before the next turn on North Tommy trail (20mi) because there would be no water for about 8 miles and we would be running some exposed areas. 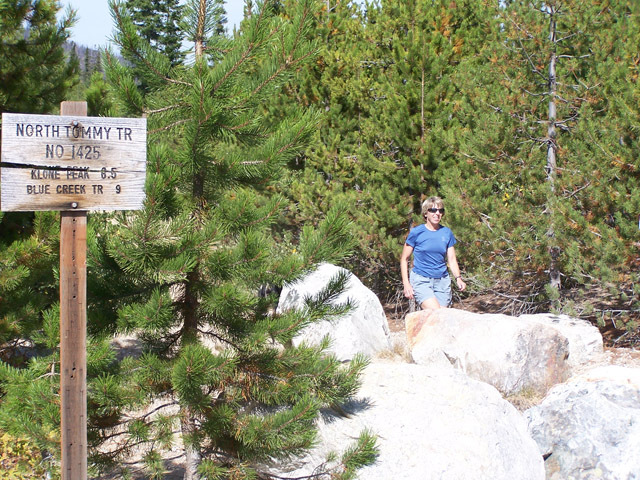 Right on N. Tommy Trail and more up another 1.2 miles until you reach a spur to the left that goes up to Klone Peak. Prior to that, we ran into RDs Chris Ralph and Tom Ripley. They were looking for Ryan Conway, who was going to drop because of a hip thing. I noticed him before the start. He was shirtless, had on a Nathan vest, had taped all his toes in some kind of black tape, and wore lightweight shoes. He had finished Plain twice before, coming in 2nd last year after Justin Angle (22:21) in a fine time of 26:44. Chris and Tom asked if we had seen him. We said no. They asked us to send him their way if we saw him, as they were heading down to Maverick Saddle. They thought he might have gone the other direction after Klone Peak instead of heading back. Wow, a drop already. Sounds like he had been dealing with the problem before Plain and I wondered if he should have started. A few dirt bikers were coming down as we were heading up before the spur. The half mile out and back didn’t feel so bad. Footing near the top is not so good, but it doesn’t last long. We saw 5 people heading down as we were going up. One of them was Ryan. We didn’t quite understand why we saw him. Did he head up to Klone Peak again? At any rate, we told him to head down to Maverick the way we came in. Apparently, he went off trail to get water and that was when Chris and Ralph must have passed him because it took them a long time to connect up with him when it should not have been such an ordeal. So big new rule, stay on the trail, even it is the wrong trail, so that search and rescue can find you. We reached Klone peak (1/2 mile from the turn) and read the message at the top, which we were expected to recite at the finish. “Chickamin Chick says drink your Ovaltine.” Either that or we had to tell them what the color of the rock up there was. Green. Pat did some more shoe maintenance as Trace and I headed down. I had a chance to eat waiting for him to catch up. We had seen Mauricio Puerto on the climb up Klone Peak and would not see him again until the finish. He finished 40+ minutes ahead of us. After climbing Klone Peak we got back on the N. Tommy trail, now 22+mi. The next stretch was long before we got to Forest Service road 5605, or 7 miles. Most of it is downhill but exposed and seems to take forever. There were some rolling sections that did require some walking. We ran through areas that had been scorched by forest fires. We passed a fading Rob Lahoe, who said he was going to drop at the next checkpoint. He was not drinking enough. This was his 2nd Plain attempt. We felt bad for him. We finally reached water about a mile before the road and filled up. It was pretty hot then and we doused ourselves. Crazy, though. We dried up pretty quick. Pat had to work again on his shoes. This would be his nemesis the entire race: dirt in the shoes that would ball up and cause pressure points. Refreshed with water, we ran to the next check point at the road. I arrived first, “Number 21. And I’m HAPPY, he’s sneezy, and she’s sleepy.” They knew we were in good spirits. This was about 29.3 miles and we arrived there in 8:53 (Adam 5:37). A short section of dirt road was followed by over three miles of asphalt. When we did this during training, we had to walk some of it. But we were able to run it all on race day. It was pretty hot at this point. There is a sharp right turn down on road #112 to a cul-de-sac where two trail heads start. The correct trail is on the left, Middle Tommy trail, which is harder to see coming from the direction of the road, and then there is Hunter’s trail to the right, but straight ahead coming in the cul-de sac from the road. It has been taken by a few runners in the past. (Michelle Maislen and Deb McInally first missed the sharp turn on #112 and ran down the road until they hit a one lane bridge. Uh oh. They turned around and made it back to the cul-de-sac but then took Hunter’s trail. Wrong trail. All in all, they lost 1hr40min.) Once again on dusty trails, we headed towards the Entiat River. Before crossing the bridge, there is a trail that heads right towards Fox Creek (mile 34) and the climb up Tyee Ridge. I started to notice my first muscle twitching here, but we stopped to fill up on water and my muscles were able to relax. 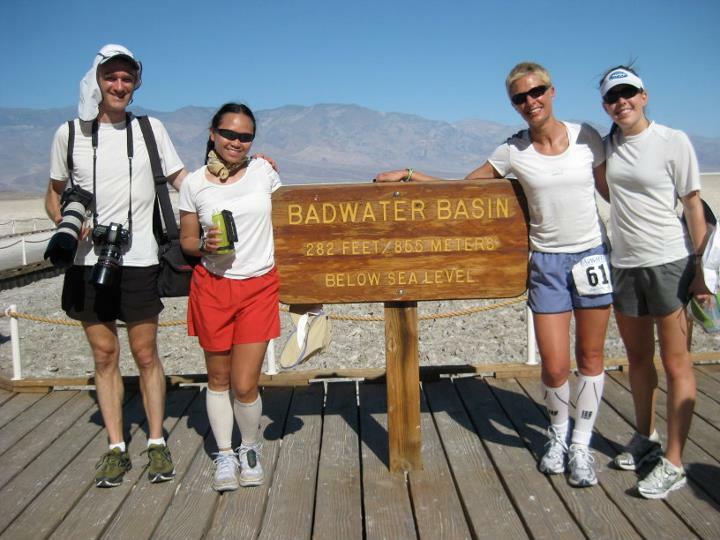 Because there would be no water for 15 miles, it is suggested that you leave with 100-120oz. Quite a load to carry on the hardest climb of the race during the hottest time of day. I peed at the base and had a chocolate croissant, feeling pretty good. We passed one runner on this climb. But the relentless up with 87 switchbacks (I counted them on our training run), started to take its toll on me. It was too tiring for me to keep drinking and taking salt and by the time we reached the top (mile 39.5) about 2hr45 minutes later, my muscles were screaming. The eccentric muscle contractions on the down put me on the edge of cramping. I walked in a circle trying to shake them out. I told Tracey to head down ahead of me, but she wouldn’t leave. “Go tell Pat I’m cramping. It’ll just take me a little longer to get there.” I was able to briskly walk down and ran a few steps but could not break stride like I wanted on this downhill. I arrived at the next intersection not too long after Trace. I was forced to power walk and pushed myself to gulp as much fluids as I could and replenish my salt. There was still climbing ahead of us, so we were hiking anyway, but when we hit some downs, all I could do was shuffle along. Pat and Tracey were patient with me, and 3hrs after my last pee, I was able to go again. I was starting to feel better. When we hit Billy Creek Trail at mile 43, I was able to run the down hills again, and there was enough in this section that I felt we were making up some time. It was getting dark by now. I saw a pair of eyes ahead of me and the deer jolted down the trail, sending dust clouds in its wake. We arrived at the next checkpoint (mile 45) at a road crossing at 15hr26min (Adam 9:50). Pat had to fix his shoes again. I had another bathroom break. We ran along for a while with some short hikes up and finally reached the section that everyone was dreading. Most of us were covering this part in the dark. The part of the race, before reaching the Mad River Trail, is very overgrown with rough footing hiding underneath. It just slows you down a lot and chews up time. For some reason, I didn’t think it was as bad as when we did it during training, but maybe because I knew what to expect. We finally reached a creek crossing and refilled. About this time, Deb McInally, who had been running with Michelle Maislen, caught up to us. Michelle was sick the week leading up to the race. She had a fever the night before the start. Still, she started but had to drop, not feeling well. We must have passed them when they got off trail. Now it was only Deb and her impressive comeback on her first 100 miler gained respect from us. She moved on while Tracey and I had a bathroom break. When we caught up with Pat, it was clear he had done some thinking. He said to me, “We need to get going if we want to make it back to Deep Creek with some cushion for the second loop.” He had been doing some math and figured we would get there at about 21hrs, only an hour ahead of the cutoff. As soon as he said the word, I took off. Now running all the downs and even some of the ups, I pulled them along that unending stretch to Mad River. We passed Wendall Doman, I believe, then Scott Tomchick on this stretch. Scott’s quads were shot, not having completely recovered from Hardrock. He was walking but amazingly still in good spirits. He was going to get back to Deep Creek and call it a day and was content with that. I asked him how long it took him last year to get from Deep Creek to Chickaman tie (the last cut-off about mile 78) and he said 7hrs. That was good to know. He wished us well. After crossing Mad River, I saw a light ahead of us getting waved around like it was someone trying to figure out where to go. It was Deb. I showed her the way we knew. Apparently, there is a trail that you can bushwhack back up to Maverick Saddle, or take the right up a short section to the road. We chatted until we got there and I showed her what direction to head as I waited for Pat and Tracey. Even though we had covered this at night on the training run, Tracey called out my name in the dark from below and asked, “Which way?” Okay, so we were probably tired on the training run and now on race day, so I can see how it can be disorienting. Fortunately, Scott was able to catch up to them and directed them towards me. We hiked back up the saddle to another checkpoint, now about 52+ miles in 18hr43min (Adam 12:09). We were all pretty spent by then. I was looking forward to some downhill and also not, if you know what I mean. Six miles of down, the first 3 on rough road, and another 3 that included some ups that we didn’t remember. I was feeling pretty good and felt I was flying but in reality was probably only doing 10min miles. Pat and Tracey followed me down. About a mile from the Saddle, I saw two people ahead walking. It was Ben Blessing and Lorie Alexander covered in their night gear. Ben said that overgrown section was the worse he had ever seen it. This was his 4th attempt to finish Plain. Lorie said that it trashed her. She is always the first to admit that she doesn’t do well with technical downhill. I wished them well but they ended up dropping at Deep Creek. We hit Deer Camp and the smoother road section. At this point, we decided to run 5 minutes and walk 1. Easy hills were a challenge now. I started to notice how quiet Pat was getting. I think his mind was in a funk from this point forward. 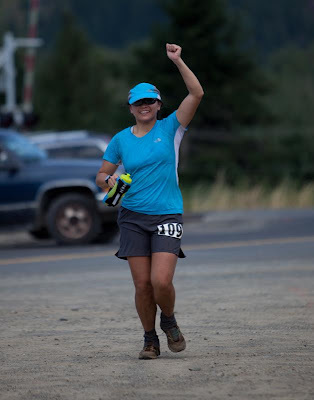 We caught up with Deb and ran the last mile with her into Deep Creek (58+ mi). We arrived at 20hrs (Adam 13:10), an hour ahead of our predicted time of 21. Karen and George Wiggins had driven their camper up and were out helping runners get through this transition. We accepted soup from them but none of us wanted a grilled cheese sandwich. George filled my hydration pack with 32oz of Gatorade and I filled my water bottles with water. I packed more GU, banana and pumpkin bread, and more chocolate croissants. I drank my soup and changed my socks and shoes. I was planning on putting on my Hokas for the rest of the run, but my feet had swelled too much and they were too tight. So I went with thinner socks but a fresh pair of the same shoes I had been wearing, Vasque Mindbenders. It still felt great to have clean feet and they worked out just fine. Only a small blister on the side of my right heel in the last 5 miles. The tight mesh on the shoe combined with my Inov-8 gaiters did not allow dirt in. 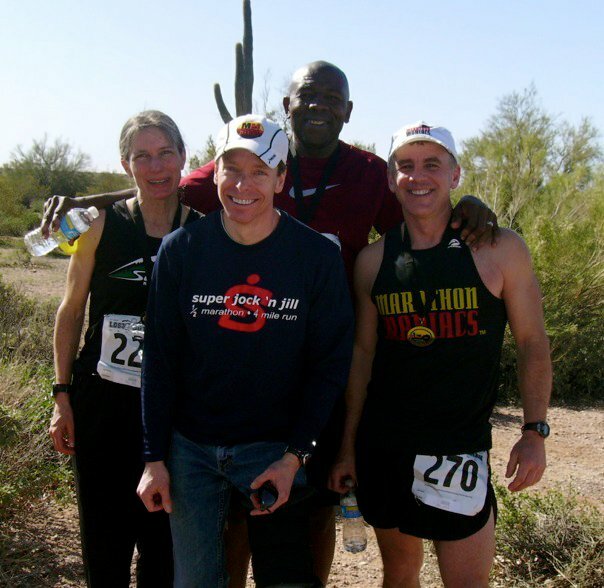 Looking ahead, I commented to Pat and Tracey that I expected it would take us 15 more hours to complete the race. (By the way, I was almost dead on. We left Deep Creek about 20:15 and finished 35:10. Do I know our pace or what?) Tracey sounded shocked to hear this. Deep Creek is where most people drop. You just have to get in and get out. Don’t get too comfortable. Karen said most of the runners before us were taking 30 minutes at this checkpoint. I think we took 15 minutes and Deb took even less, something like 10. We headed up Lower Chiwawa Trail knowing it was going to be a long time before we would see Deep Creek again. There is a lot of downhill running on the first 2 miles of this trail, which we knew would mean a lot of up at the end. This second loop is like a lollipop. Seven miles out, then a big loop, and finally that same 7 miles back. I was pressing along just as Pat had instructed me earlier, but I kept losing them. I ran into Deb coming towards me. She had hit a road and was not sure which way to go. I told her that there was a sign for the trail to the right of the road. She told me later she ended up finding it and thanked me for the help. Tracey and Pat caught up. I feared doubt had started to creep into Tracey’s head when I mentioned the 15hrs. She started to say she probably should turn back but Pat would not have anything to do with it. After about three miles, I found myself waiting for them to catch up again and Tracey finally said that she was not able to eat enough to keep her energy up and her tendonitis was bothering her. Pat tried to get her to continue but said that we needed to get going or we were going to keep losing more time. She said she didn’t want to jeopardize our chances of finishing and urged us to continue on without her. Reluctantly, we left her to run back on her own. Pat and I took off. We wore ourselves out trying to put in some good miles as quickly as possible. I finally said to Pat that we’d better pace ourselves. It was very hard to run over the dirt bike loop-de-loops. I kept coming down hard on the lows and running into the highs. I learned that having a handheld light would have been better to see the shadows on the trail. But it was in the bottom of my pack and one hand was already holding a bottle. I wanted one hand free to eat food. So I wasted a lot of energy tripping around. Pat continued to be very quiet, which is unusual for him. I don’t know if it was because we didn’t have Tracey anymore or if the miles were getting to him. I kept pushing ahead of him as best I as could. We reached road 62 at mile 65, the start of the big loop. Although there was some flat and downhill here, we were looking at many climbs. As we approached 24hrs, we were looking forward to the sun coming up in an hour. Just about then, I was struggling to stay awake, something I had never experienced before in a 100 miler. I guess I could blame it on Cascade, work, and the heat. I think I was sleep walking for about 5 minutes. The constant climbing was hypnotizing. The sun came out and we were thrilled to take off our headlamps. Finally, we reached a change in the terrain. It was rolling for the next 3-4 miles with several crossings with water. Of course this took way longer than we remembered on the training run. We turned right up the Pond Camp Trail for 2 miles of more up. It took us 7 hrs to reach the Chickamin Tie check point (same time it took Scott Tomchick last year) from Deep Creek, and 27hrs total, one hr ahead of cutoff (Adam 18:30). Our split was pretty good compared to others. Chris and Tom, along with a couple of other S & R volunteers, were there to greet us. They told us that Deb was only 10 minutes ahead and Eric 20. They also said that what we just did up until that point was the “real Plain.” What lay ahead was much easier. Just 4 miles of nice trail up, then a run in the meadows, then the climb to Alder Ridge, then down the other side to the last 7 miles we already knew. All I can say is that it was still very hard! Pat and I hiked up, stopping occasionally to fill water or dump out dirt from his shoes. This was really frustrating him. It didn’t take long for enough dirt to accumulate in his shoe before he had to do it again. Still we moved up the trail well enough that we were able to complete that climb in less than 1 1/2hrs. At one point, I let out a “whoop!” and heard Eric above us say, “Hey, Van.” But when we rounded the corner, he was gone. There were these boulder field crossings that were very hot from the heat retained in the rocks. We were now entering territory that we had never seen before because we were turned around by snow on the training runs. We finally came to a new intersection for us. We followed the directions and started climbing again. I was a little wary because Chris and Tom had talked about running in a meadow on this section. I was not expecting more climbing so thought we made a wrong turn. But we rechecked the map and didn’t see any other trail to get on. We did encounter some meadows, so thought we were probably okay. But in my Plain brain state, I kept thinking I had seen that turn before, or that rock, or that funky looking tree. I said to Pat, “I’m having déjà vu. Are we running in circles? He placed a marker on the ground. I had us both freaked out. In about another 5 minutes, Eric was running towards us! “#@%!” He said he wasn’t sure if he was on the right trail either and turned around. We looked at the map again and decided we would just keep moving in the direction Pat and I were going. Fortunately in about 1.5 miles, we reached an intersection and confirmed we were where we needed to be. But we hadn’t run into any water for a long time and Pat and Eric were dry. I let Pat have some of my water. In about half a mile, we came to a creek. It wasn’t a very fast flowing creek. But Pat said, “Oh screw it.” He was tired of treating his water and was so thirsty. I still treated mine. Many runners just scoop and go and never have any problems. I wasn’t going to take my chances. We headed to Alder Ridge trail but didn’t realize it was further away. So we again questioned if we were still on the right trail. This feeling of uncertainty sapped our energy. We kept moving in the direction that we thought we should be in and ran into some dirt bikers. They pointed us in the direction of Alder Ridge trail, saying it was 1.5 miles away. We were pleasantly surprised to find it in half a mile. It took us about 40 minutes to climb up to the top of the ridge. The heat was stifling. The run down the ridge was on the sun exposed side and there was little water on this trail. Plus, we were passed by a couple groups of bikers. The clouds of dust and fumes made this part of the run even more unpleasant. I could see how on a random day, this run would be enjoyable, but not after 89 miles. After all, it was mostly downhill. The concrete pads that the bikers laid down on the trail at steep switchbacks were starting to hurt our tender feet. About ¾ ways down this 5 mile stretch, we did encounter some water and tried to cool ourselves. Pat fixed his feet and we made our way down to the road. We were now 95 miles through with Plain. We saw Deb ahead trying to figure out which way to go. Eric directed her in the correct direction. This part he knew. She joined us then. I led our new group in from this point on because they were all kind enough to avoid aggravating my asthma. About a mile on this trail before we hit another road. Now, Pat and I knew where we were. This is the part we drove to Friday. Eric said that it was just a mile before we got back on the trail on our way to finishing the loop. Pat and I knew better. We had just driven this and it was much farther than that. In fact, it was a little over 2 miles. Now this seems mild but not at this point in the race. We employed the run 5 walk 1 rule, but I was having a difficult time with even this ratio. Finally, we got to the trail and had about a mile to the final check point. We stopped at the creek there to cool down again. Our time here was 33:23 (Adam 24:15). Two and a half hours to finish 7 miles. No problem, right? With 3 runners following in my footsteps, I got us to the finish in 1:47. Only the top 3 finishers, Adam, Tim, and Joe ran faster. About halfway home, we stopped one last time at a creek. Our screams of ecstasy when we poured water on ourselves were almost orgasmic. We spent a good 5 minutes there. Just about then, my heel blister was really starting to hurt. But so what? We were going to finish Plain! The last two miles, there were a series of short but steep ups. All I can say is that I wouldn’t have expected less from this course. After the last climb, there is ¼ mile down. I thanked Eric and Deb for joining us and Pat for sticking with me. We let out hoots and hollers to let the finish line crowd know that we were coming. Cheers came from below. As I came out of the trailhead, I stopped and gave Pat my hand, he gave his to Deb, and she gave hers to Eric. We finished hand in hand. The only thing that was missing was Tracey. But she was there all smiles to give us a finisher’s hug, so proud of us. Hugs all around but into chairs as soon as possible. It was nice to finally sit. I said, “Take this pack off me!” Chris helped me out of it and I told her to just throw it on the ground. Ah! Freedom! Me and Pat post Plain-thumbs up! Unfortunately, Ken arrived 5 minutes after we finished. He had to take a detour because they closed Hwy 2 for an accident. He fed me and forced me to drink. I gladly handed over $40 to Michelle, Eric’s wife, for my Plain buckle. Pat was in a daze for about 15 minutes but soon came around. I’m not sure if he even remembered the last 15 hours. We took off our shoes finally. My feet looked fabulous! The blister on my heel was tiny but it jabbed me like a knife. I changed into a fresh shirt and Pat and I donned our new sweatshirts. Everyone at the finish was so helpful. Tracey took care of Pat. She said she tried to sleep in her car when she got back to Deep Creek but it smelled too bad in there. She only got about an hour. I made a new friend, Deb. Mauricio Puerto had finished 43 minutes ahead (34:37) and was still there when we came in. It was his second Plain finish and a PR by 29 minutes. Betsy Kalmeyer finished her first Plain a minute ahead of him but was already gone. Christi Masi won the women’s race in 31:55. There were 9 women who started and 4 who finished. Of the 16 men who started, Adam Lint finished first in 25:44 of the 7 who finished. Tim Stroh came in second in 27:25, his 6th Plain. It was neither a PR nor PW. His PR is 26:59. Joe Lee finished for the second time in 29:31. In 2007, he finished in 31:52. Miles Olrich ran the entire time with Christi and also finished his first Plain. This was Christi’s first Plain as well. It might have even been her first 100. Our split (Pat and I) from Deep Creek to the end was very respectable (15:10 compared to the fastest where Adam ran 12:34). Finally, I had to go. It would have been nice to stay longer and celebrate. But I had to work the next day. 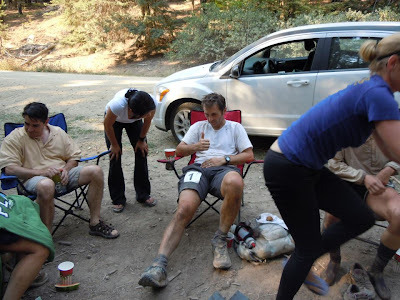 We loaded everything into Ken’s car and headed to the LWRC to claim my Plain finisher’s rock. Although I couldn’t smell myself or my gear, Ken said the smell in the car was unbearable. He said it smelled like sweaty socks. Even though I had forgotten my deodorant, I don’t think it would have made a difference. He had to drive most of the ride home with the window down and his head halfway out. I went into the LWRC to pick up my rock. I gave it to Ken and said I would meet him outside since I had to use the bathroom. Apparently, Tracey and Pat had pulled in while I was in the bathroom. I came out and got into the car. Ken said, “What are you doing? That’s not our car!” I didn’t realize that I was getting into Tracey’s car. Ken said I must have Plain brain. Come on, give me a break! Both their vehicles are gray SUVs, and I had spent the weekend in Tracey’s car. He thought I forgot something in her car and was just getting it out. But when he realized I was going to close the door, he stopped me. We stopped for Mexican food on the way home. I made it to bed by 7:30 to 8pm after a thorough shower. I managed to get some sleep. Most times, even if I’m exhausted from my effort, adrenaline keeps me awake. I was up at 5am and at work by 6:15. After patient rounds, I was in surgery until almost 5pm. I wore compression socks, but my calves and feet ballooned by the end of the day and really ached. My calves were so tight. My doctor said I was probably experiencing a mild form of compartment syndrome. Fortunately, I had Tuesday off. My breathing after Cascade was much worse than Plain, and Plain was by far the dustier course. I think because there were fewer runners kicking up the dust, this made a huge difference. Plus, running in front was key for me. I can’t thank Pat enough for letting me do this. 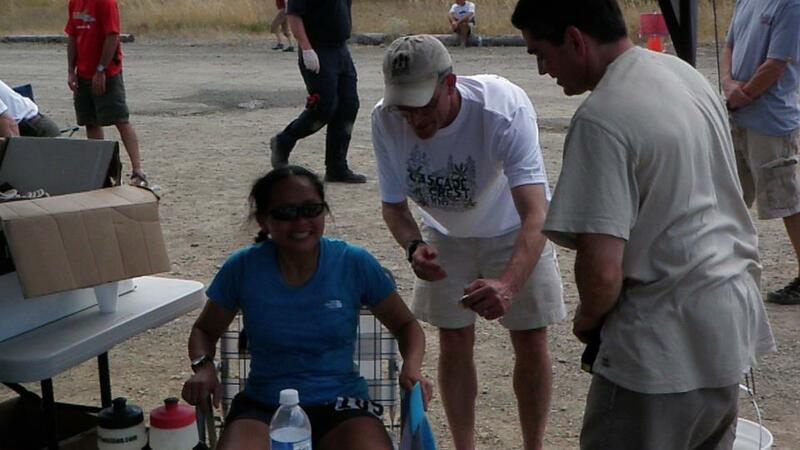 I was signed up for Cle Elum 50K the following weekend but decided to be smart and volunteered instead. Although nothing hurt, my energy level was not quite restored to take on a challenging 50K. It was fun seeing runners come through at mile 7 and I had a fun crew to work with. 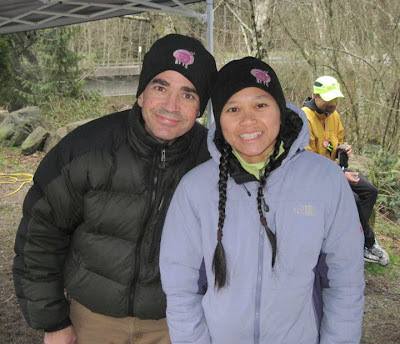 Two weeks after Plain, I did run the Middle Fork 50K put on by Eric Bone’s NW Trail Runs. This was an extremely fun course, but the heat and humidity and my stupid desire to not have a pathetic finishing time resulted in me redlining it for all but the first 5 miles. I over hydrated when it was still cool and didn’t hydrate enough when it was hot. I ran most of the race on the verge of cramping. I couldn’t seem to catch up fast enough on my drinking and salt and still pushed myself. Gwen Scott, who I carpooled with me, finished first in 5:14 and I sprinted as fast as I could in the last 6.6 miles to finish just under 6 hours (5:59:54). Gwen was surprised to see me sprinting to the finish line just after finishing Plain. Waddling fast was more like it. As soon as I finished, I just needed to keep walking to prevent the inevitable cramps from happening. Gwen brought me chips, soup, and chocolate milk. The milk took the ache out of my legs but the cramps were still looming. More salt tabs and gentle walking. When I thought things had calmed down enough, I sat to take off my shoes. My inner thigh cramped when I did this and it jolted me up. I had to keep it stretched. Once I had it calmed down, I walked around a little more. Finally, things seemed good enough for the drive home. I didn’t cramp again, but my muscles were not happy with me. They wanted to know why I had to push it so hard. Two weeks later after Plain, as I am writing this, I still feel the glow from finishing. I believe the harder the struggle, the more meaningful the finish. I know I will be back to Plain and I hope she will let me tame her again. Thanks Chris and Tom for providing the ride! "DON'T WORRY, IT'S NOT PERMANENT"
"You can do anything that's time limited, even child birth concludes with a prize! along with the baby or in this case finish, additional rewards; a shower & rest!" 1. Nothing is promised to you except a damn tough course. 2. There are no nurseries on the trail. 3. This is a no WHINE zone. 5. This is a DO-IT-YOURSELF race. 6. The exultation of Plain is knowing that you have competed in one of the toughest, unsupported 100’s in the U.S.
7. Run it! Tuck it in! Shut up! Get moving! This is PLAIN.!!!!!!!!!!!! For a race with no aid, Christi and I had one of the best aid station experiences in any trail race. station I've ever been at, even though I was promised "no aid".